In 2005 Royal Ascot temporarily relocated up the road to York. 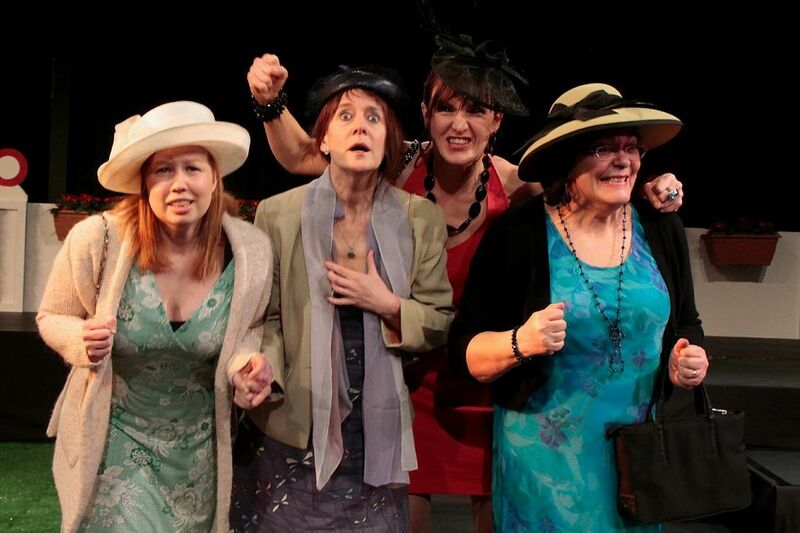 Amanda Whittington captured this moment in her highly entertaining play Ladies’ Day. This year, The Dulwich Players proved to us that this racing romp has lost none of its joy or poignancy. Ladies’ Day shows us a glimpse into the life of four fish factory workers from Hull who decide they need a day away from their predictable work lives. As one of the workers is leaving the factory, she suggests that they all celebrate her departure with a girls outing to the races. After struggling to secure tickets, a lucky find gets them into the event. As the four excellently drawn characters begin to enjoy their day, their personal lives and relationships are unveiled in both humorous and somewhat more serious interactions. Lydia Dickie was a confident and forthright Pearl, hilariously insistent throughout with her mantra that, in spite of her age and planned exit from working at the factory, she was “NOT RETIRING”! Lydia also handled Pearl’s surprising confession that she had taken a lover and then their touching reunion with real feeling and romantic sensitivity. Linda, the baby of the group, was played with suitable naivety and shyness by Sarah Whyatt. When, at the end of the play, we learn that Linda has finally stood up for herself against her parasitic mother, the audience’s tangible relief was a testament to Sarah’s delivery. Sarah effectively made us feel rather protective of Linda, which meant we were overjoyed when her happy ending finally came. Sheree Clapperton’s performance as Jan, the mother-hen of the group, was a delight to watch. Clinging to dreams of her daughter’s academic success and repressing her romantic aspirations towards a fellow co-worker, Sheree’s portrayal of Jan was often heart-breaking. 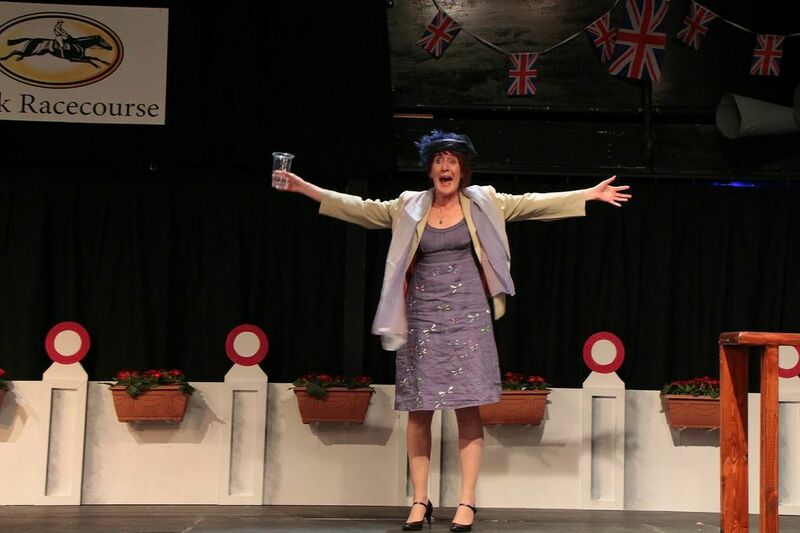 Jan’s somewhat over-indulgence in champagne during race day gave rise to a scene stealing performance by Sheree. Her exemplary comic timing and well-observed attention to detail were a triumph. Hannah Tomlinson burst on to the stage as Shelley, the brassy good-time-girl. Hannah’s coarse delivery and no-nonsense physicality had us hooked from the start. She was also careful to capture Shelley’s fragility towards the end of the play as her ‘front’ melted away exposing an increasingly desperate and insecure side to her character. 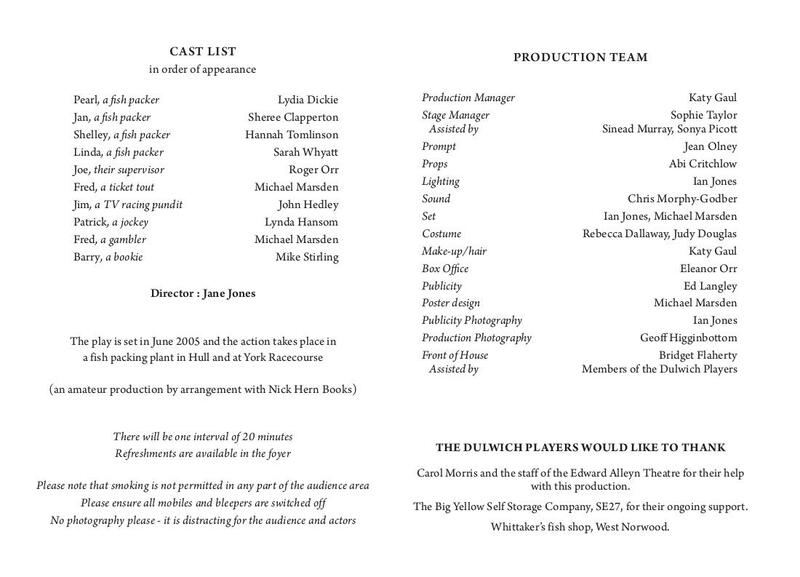 Here is an actress with a dynamic stage presence and we hope that this is her first Dulwich Players production of many. Whilst the four ladies are firmly front and centre of the action, they were ably supported by the male cast. Michael Marsden (as both the fabulously greasy ticket tout and washed-up gambler) and John Hedley (as the rather dangerously sleazy TV presenter) effectively provided a nod to the darker side of gambling. Whilst Mike Stirling gave a sensitive performance as Pearl’s lover Barry and Roger Orr gave us a delightful Joe, the affable love interest of Jan.
Special mention in a supporting role must go to Lynda Hansom who played the disillusioned jockey Patrick to perfection. Opening the second act of any play requires real skill to instantly recapture your audience’s imagination and Lynda did just that. The delivery of her monologue (complete with flawless Irish accent) was mesmerising and the unfolding of the following scene with Linda felt uniquely engaging and intimate. Recreating a fish-packing factory that transforms into a prestigious horse racing event (and back again!) certainly required ambitious staging. However, the backstage crew were victorious. They presented us with an imaginative package of set, props, costumes, lighting and sound that really captured the look and feel of these two very different venues. The friendly front of house and bar staff should also be commended for adorning suitable attire and getting into the race day spirit! Ladies’ Day is, at its heart, a story of friendship and Jane Jones’s strong direction captured the overall optimism of the piece. The carnival-like atmosphere amongst the audience as we spilled out of the theatre was proof of this – and who knew there were so many Tony Christie fans hiding out in Dulwich….?! Altogether now: Is This The Way To Amarillo?…..Every night I’ve been hugging my pillow…. !